After installing Outlook's January 2018 update, some users are unable to edit signatures. Microsoft has identified the cause as having both the Windows app store version installed as well as a "normal" version. This would be the case if you have a new computer and Office was preinstalled, then you installed your own copy of Office. After uninstalling the Windows store app the Signature or Stationery and Fonts button should work. 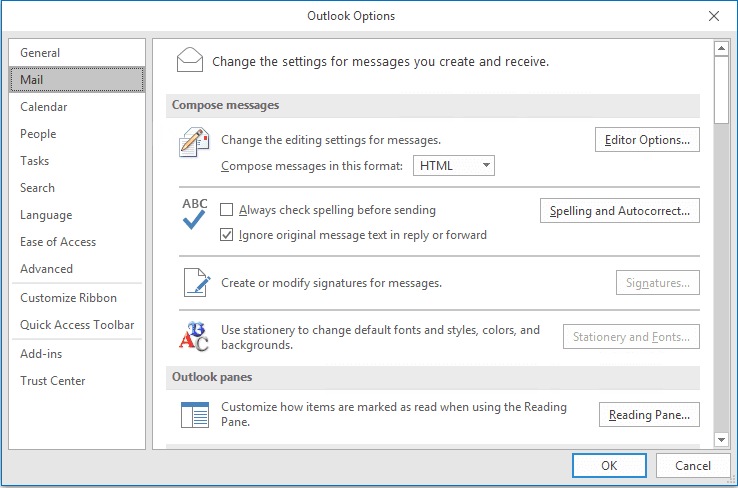 A fairly common problem for 64-bit Windows users is that Outlook's Stationery and Fonts or Signatures buttons won't work. When the Stationery and Fonts or the Signatures button is grayed out or won't do anything when you click it, you may need to edit the registry. First, empty your Temporary Internet Files. This may or may not help much, but even if it doesn't do any good, your Internet cache will be clean. Don't forget to restart Outlook after editing the registry. To open the registry editor, press Windows key + R to open the Run command. Type regedit into the Run field and press OK to open the registry editor. THANK YOU for this post. I have been waiting for our company's IT dept to fix this issue for me for MONTHS, along with another email issue I have been having. Finally sick of waiting and decided to google it my self. SO HAPPY I found this post. It worked; even on my Outlook 2007!! Thank you, thank you, thank you!!!! I have been googling this error for 3 months, and you are the first person to have a solution!!! It has been SOOOO annoying. Thank you so much, it worked. You really assisted a BC (before computers) person.